We saw a similar scene earlier this month, one becoming all too familiar in the ISIS-infested cities of Europe. That is shoppers and tourists running for their lives amid an unfolding terrorist attack. It happened in Stockholm, Sweden, where hundreds of thousands of Muslims have been housed and supported because Swedes have been convinced that their guilt for having lived in peace and prosperity must be assuaged by importing hordes of conscienceless zealots, deemed “the poor” by the press and by posturing politicians. Last month it was London, where a vehicle was used to bludgeon pedestrians on Westminster Bridge on its way to the gates of Parliament. It should come as no surprise that terror has Paris again, this time on the famed Champs Elysee boulevard, again sending locals and tourists running for their lives. French police had the perpetrator on their radar, (just as Swedish authorities knew the beer truck terrorist and British authorities knew of the Westminster terrorist) another ISIS devotee dedicated to the destruction of Western civilization and the worldwide conquest of Islam. As terrorist attacks go, the bloodthirsty Champs Elysees killer was only marginally successful. Experience shows that a single terrorist carrying out a murderous mission in an unarmed society is often capable of taking out dozens, sometimes forty or fifty carefree civilians at a time, or, as in the case of the attack in Nice, eighty-six civilians. But this one targeted a random police vehicle slaughtering a Paris policeman, grievously wounding two other policemen and wounding a passing female tourist. And it’s not like the French authorities didn’t know all about this murderer. They think he was “radicalized” while serving a fifteen-year sentence for the attempted murder of two police officers. That little detail should tell us all we need to know about the rationalization of the Muslim situation in Europe. Let’s try to get this straight. They’re saying he wasn’t “radical” when he attempted to take innocent lives in 2001? He only became “radicalized” while serving a sentence for attempting to murder Police officers? If that’s not willful ignorance! Police had him in custody only a matter of weeks ago, on suspicion of trying to obtain weapons and plotting to murder police. But they let him go for lack of complete evidence, in February! Now one fine young police officer is dead, two others have life threatening injuries, and a female tourist has been maimed. Debate is raging as to whether the incident was meant to have an impact on upcoming elections, already getting underway for the French presidency. If so, what effect might it have? Marine Le Pen is regarded as the “far-right” candidate, striking fear if not hatred into the hearts of the politically correct establishment. She’s being accused of “taking advantage” of the attack for political gain. Oooh, that would be wrong, wouldn’t it? It would be beneath elite dignity to bring up a murderous ISIS attack on the Champs Elysees a day or two before preliminary voting commences. How low can she go; her opponents want to know. What a cheap ploy! To summarize, it was a religiously motivated act. The perpetrator had material praising ISIS in his car, along with a copy of the Koran. ISIS immediately took credit for his actions and called him one of their “fighters.” Funny how these sneak-attack murderers are lauded as “brave fighters.” It’s a Muslim thing. If it doesn’t strike you as legitimate, you just don’t understand. But here’s the real kicker. The French maintain a list of terrorist suspects living in their midst. There are 10,000 names on that list, and this murdering piece of ISIS was one of them. Now, there are only 9,999 others that need to be “watched” like this guy was, and that’s just in France. As one analyst recently remarked, “He wasn’t a lone wolf, he was a known wolf.” There are tens, if not hundreds of thousands of them currently residing in Europe, and there is little doubt that sooner or later the domestic population will have enough of “running for their lives” as dozens of terrorist attacks continue to play out. The problem has grown massive in the United States as well. Would be, wannabe terrorists are everywhere. You can’t go anywhere or do much of anything without being struck with the realization. Meanwhile, the war drums are pounding in and around North Korea. You can’t have missed the widely publicized military parade in Pyongyang, with the plump little dictator beaming at the display of goose stepping soldiers amid missiles on display. The finale featured the fictional destruction of an American city by North Korean missiles. While the U. S. Navy takes up positions at the ready, it appears that even China may be bending to the embarrassment Kim Jong Un has become. No one seems to know if the missiles he displayed are real, or made out of cardboard. But the threat of war is real, and Seoul, South Korea and the cities of Japan definitely are within range of firepower that has been successfully demonstrated. It appears that the inevitable consequences of Democratic Socialism may be reaching critical mass in Venezuela. Mass demonstrations, brought about by poverty and starvation, threaten the ruler-ship of Nicolas Maduro, successor to Hugo Chaves. His government seized a General Motors plant earlier this week, which mimics similar actions against foreign corporations taken by his predecessor. An article in the New York Times lists a who’s who of corporations that have done business in Venezuela and its government, and shows that they’ve had to write off hundreds of millions of dollars in unpaid debts. And so it goes in this Utopia of Democratic Socialism. It’s a pattern we’ll see play out elsewhere. It’s a philosophy being taught as “fair” in American universities, and one that was preached and promoted by the losers of our recent presidential election. The United States may have elected Donald Trump President, but we are still living in an Obama world. The media, the educational system and the big corporations are hooked on the kind of political correctness that is imploding wherever it’s had time to metastasize. DID YOU EVER REALLY WANT TO MAKE SENSE OF TODAYS NEWS? THOSE WHO STUDY THE BIBLE JUST A BIT (WE’RE NOT TALKING ABOUT RATHER POMPOUS SELF DESCRIBED ‘BIBLE SCHOLARS’ – IT GOES RIGHT OVER THEIR HEADS) RECOGNISE THAT THE TIMES IN WHICH WE LIVE ARE SUMMED UP IN CHRIST’S ANSWER TO HIS DISCIPLES CONTAINED IN MATTHEW 24 AND MARK 13 AS TO WHAT WOULD BE THE SIGNS OF HIS COMING. But then to really understand the times in which we live it is necessary to understand Bible prophecy. We are told to WATCH. But watch what? Watch who? Bible prophecy overwhelmingly speaks of God’s chosen nation Israel. It speaks of other nations as they interact with Israel. Most people today, especially those pompous self styled Bible scholars, believe that the Jews are the only peoples to descend from the ancient Israelites extant today. They seem to ignore the fact that Judah (the tribe that gave rise to the term ‘Jew”) was only one of ultimately thirteen tribes of Israel (Joseph’s two sons, Ephraim and Manasseh added to the other eleven). They overlook that after Solomon the Kingdom of Israel split to become the House of Judah (centred around Jerusalem and the Tribe of Judah) and the House of Israel, the Ten Northern Tribes. And that four books of the Bible 1 & 2 Kings and 1 & 2 Chronicles are largely devoted to the separate national histories of these now two separate nations. 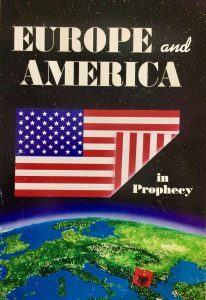 The book, “Europe and America in Prophecy” details the history of both the Jews and the House of Israel, from Abraham through to the captivity of the House of Israel by Assyria in circa 720BC and the separate history of the House of Judah through to it’s removal in exile to Babylon decades later in around 600BC. But it goes much further to flesh out the modern identities of those ‘lost’ ten tribes, who never did return to the Holy Land. Where did they go? Where are they now? WHO are they now? Knowing that the bulk of Bible prophecy relates to “Israel” (and that Jacob blessed Joseph’s two sons, Ephraim and Manasseh, saying “16The Angel which redeemed me from all evil, bless the lads; and let my name be named on them, and the name of my fathers Abraham and Isaac;” Gen. 48:16 (Jacobs name had been changed from Jacob to Israel), then we can conclude that those nations today, one a great nation, the other a company of nations, reaped both the blessings of God, but are soon, and even now, are reaping the curses for disobedience to God. To understand todays news you need to know the central players of Bible prophecy. This book will guide you through the scriptures and secular history to identify those nations. This world is on a collision course with the culmination of prophecy. You can locate and understand the truth. It’s up to you what you do with the truth.